Who in the software engineering and software development fields uses Twitter to tweet about relevant happenings in the field? 140 characters is hardly the format to get any real pearls of programming wisdom. Most (but not all) programming concepts/thoughts/ideas require more space to be articulated. I would follow the blogs of the list of programmers that everyone is suggesting. I maintain a list of over 2300 StackOverflow (SO) twitter accounts sorted by reputation. I mined the latest SO data dump for all users with twitter accounts, then calculated each user's top tags based on most votes, and finally sorted the lists by user reputation. I also mined the available Stack Exchange data dumps. The list of members for this site will also appear on the next data dump. I would then search by name, starting from the book authors you are reading. For example: i'm currently reading Professional Android Application development by Reto Meier; Googling his name + twitter i get his twitter account. These are all developers or people who post on technical topics, ordered by amount of interesting programmer-related content. The list is Mac-centric. I have a little list of Programming Elite ... take the name lightly, there maybe a few on the list whom I only thought were elite, and it's by no means got everybody. Also, the best way to find smart people to follow is to look at programmers whom you highly respect, and look at who they are following. It depends. Each person has his/her own specialty. 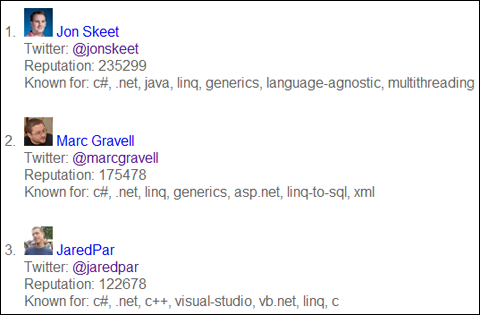 I program in ASP.NET MVC, so I follow shanselman (Scott Hanselman), haacked (Phil Haack), scottgu (Scott Guhrie), and igoro (Igor Ostrovsky). I am really glad they share their knowledge. I learn a lot from them. For Java Programming: Swapnil Bhattad. Once you group them, you can use any of the above lists (they are exhaustive) and look at who they are following. Chances are, you'll find a few interesting ones there. This way, you'll slowly build up a nice set yourself. Try to keep the number around 100+. But trust me, its an ocean of information out there. I spend at least an hour a day going through all the tweets. Nobody at all. Stop browsing sites like twitter when you should be coding. Then watch your productivity improve. Not the answer you're looking for? Browse other questions tagged twitter social-networks or ask your own question. What are the pros (and cons) of using “Sign in with Twitter/Facebook” for a new website? Is it practical to use Twitter for service logs? What kinds of copyright or privacy issues apply to tweets? What could be the best way to generalize data from Facebook and Twitter? Performing client-side OAuth authorized Twitter API calls versus server side, how much of a difference is there in terms of performance?